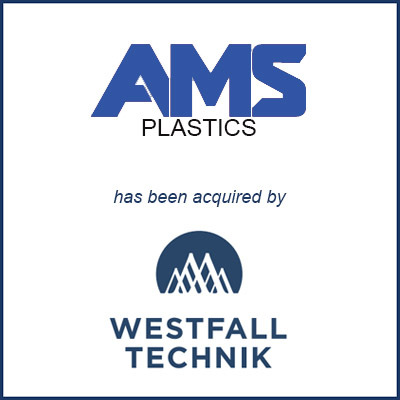 El Cajon, CA – March 2018 – AMS Plastics of El Cajon, CA was recently acquired by holding company Westfall Technik of Las Vegas, NV. AMS Plastics is a custom molder specializing in the medical, consumer goods, and packaging industries. The business employs about 300, operates 32 injection molding machines with clamping forces of 50-1,000 tons and utilizes a 4,000-square-foot Class 8 clean room. The presses include some with vertical clamp and multi-component molding capabilities. In addition to custom molding, AMS offers value-added secondary services for product decoration and assembly. Westfall Technik has invested in tool makers and injection molders since Managing Director Brian Jones, a plastics industry veteran, formed the Las Vegas-based holding company in 2017. Now including AMS, the holding company’s five businesses operate more than 65 injection molding machines with clamping forces of 35-1,000 tons. Molding Business Services represented Westfall Technik in the transaction. The excerpt above was taken from a publication in Plastics News. Click here to read the full article.